After watching my regular fav YouTubers XSparkage and Queen of Blending, I was turned onto a new mineral makeup company that just seemed right up my alley. This company is called Lime Crime Cosmetics. The owner Xenia has a popular blog where she has the most amazing pictures of herself modeling her makeup and her eclectic style. I was hooked once I saw how she created such dramatic looks. She also has a great wardrobe and sense of fashion. As you can see, the whole idea of this company is super bright, fun makeup. The colors are absolutely amazing. The owner definitely plays into the fantasy aspect of makeup. The pigments all have fun names and a little story behind them. The mermaid lived in a creek behind the levee. Each night, when the village lights languished and people were fast asleep, she climbed on top a big rock and sang songs of faeries and unicorns, moonlight dancing on her shiny, green tail. It was very difficult for me to choose colors since they were all gorgeous, but I ended up picking my favs. 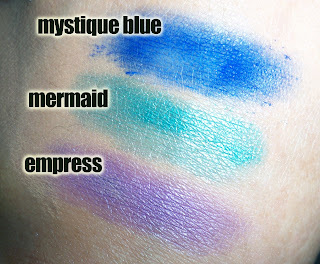 They are: Mystique Blue, Mermaid, and Empress. Swatches done dry without a base. 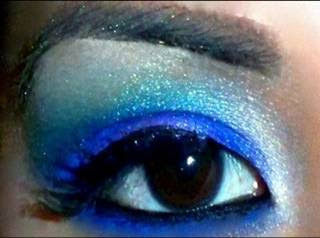 Here's a pic of a look I created using the shadows. As you can, they're super pigmented! I tried filming a tutorial but I accidentally poked my eye and it was a waterfest. But you can see the final look. This is a great new company out there, definitely check them out! They also have brushes, an amazing primer, and other face products. You have 24 hours to email me your name and address and i'll mail you your product this week. Thanks for participating! Ooh pretty. I have a hard time wearing such bright colors but, I've found a way to wear it that works for me. When I wear brighter colors I don't use such a large area on my lid so I can still wear the bright color but, not be so self-conscious. I LOVE lime crime. My favourite colours ever are from here. You need need need to try nymph. Its amazing. And the pixie dust is a fav too. how do they compare with Taylor Made Minerals? is the pigment similar?